The Encyclopedia of Food Chemistry is the ideal primer for food scientists, researchers, students and young professionals needing to quickly acquaint themselves with food chemistry. Well-organized, clearly written, and abundantly referenced, the Encyclopedia of Food Chemistry provides a foundation for readers to understand the principles, concepts, and techniques used in food chemistry applications. Articles are written by international experts and cover a wide range of topics including food chemistry, food components and their interactions, properties (flavour, aroma, texture) the structure of food, functional foods, processing, storage, nanoparticles for food use, antioxidants, the Maillard and Strecker reactions, process derived contaminants, and the detection of economically-motivated food adulteration. 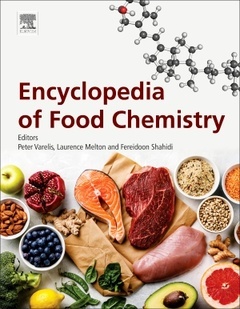 The encyclopedia will provide readers with an introduction to specific topics within the wider context of food chemistry, as well as helping them identify the links between the various sub-topics. Authors from research and industry will ensure that chapters are of high quality and reflect the latest knowledge and methods in the field. Its wide and interdisciplinary scope makes the Encyclopedia of Food Chemistry truly unique.